Cathy Olphin is a student at Lancaster. She is leading a landmark legal case to recover compensation from the University over the strike disruption, and we talked to find out what she was doing, and why. What motivated you to take up the case? I thought wait just a minute, this is about about a tenth of our year we are losing. I was thinking of a way I could show solidarity with the lecturers, so I emailed one of the lecturers and said I’m looking at the case for a refund, do you think that’ll help your case or be seen as against it. Luckily my godfather is a solicitor, he had a look at it and showed it to a barrister at his company who said this is a very good case. And then they got me involved with Leigh-Day (the legal firm representing Cathy). It really just started with me going oh, you know, this could be a good way to make a bit of disruption, and it snowballed a bit. Why do you think many people assume this is an anti-strike move? I think a lot of people have this idea that students are entitled, which is a crazy idea considering how little we have dedicated to us, but they sort of have this idea that students are being a bit greedy and wanting something from it, or that they are a bit anti-lecturer which is why they are looking for a refund. But I started the case while the strikes were going on, I saw it as a way of stopping the strikes earlier. When they were suggesting the extra 14 days I thought having a big legal case might encourage them to close the negotiations. Do you think you’ll be able to pin liability on Lancaster, rather than Universities UK or the UCU? Do you think the Students’ Union should be backing your case? Yes. 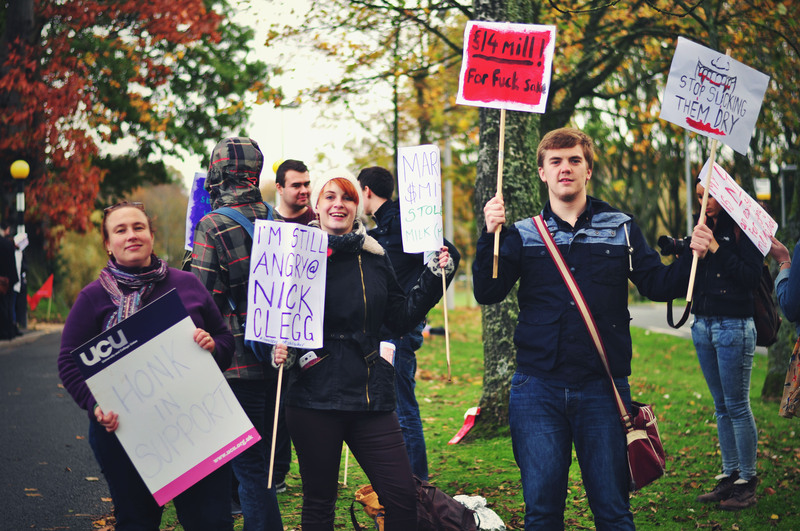 Unfortunately the Students’ Union weren’t in favour of the strikes, which I was confused about considering many of them around the country were. I’ve contacted them and the National Union of Students. But I haven’t received much of a response to it, considering how big it actually is and what it might turn in to. I’ve contacted the Student’s Union and I was told they’d get a response but unfortunately I haven’t received one. But I’d love for them to get involved if they could. Has the University been in contact with you about the case? Many people are concerned about the marketisation of higher education – do you think this case entrenches that? I think this case absolutely shows the problems with it. Now we’re consumers, now you have to follow the consumer rights act, you have to start considering what you provide for students. The privatisation has put us on top. This would not have been happening 20 years ago. We wouldn’t have had university contracts, we didn’t have fees, if we’d missed a tenth of our year it wouldn’t be seen as such a big deal. It would have been what, £100? But now it’s £1000. Is this going to take up a lot of your time personally? I think most of my work has been done already. It’s been very stressful over the last few weeks. But I think it’s definitely worth it. This whole case for me has been going on since the start of the strikes. Lots of campaigns, lots of trying to get people involved, lots of filling in legal forms, talking to lawyers everyday. But it’s been a really good experience, I’ve enjoyed it. Though I’ve never had any experience in law before so this is totally out of my comfort zone. Ideally we’d get our money back. The University would hopefully change their contracts and change their attitudes towards striking lecturers and try their very very best to make sure the lecturers are getting everything they can so they don’t go on strike. We want to get some interest nationally and, in the media, tell them that students are a force to be reckoned with. We’ve been pushed quite a long way with the tripling of tuition fees, and the tripling again, the taking away the maintenance grant, the interest rate. We’re setting a precedent, saying you can’t push us too much further.